I cannot resist being caught up in the post-Thanksgiving shopping mania. Here's my deal. Purchase the ebook original Drop By Drop: A Thriller for $3.99 and I will send an e-copy of Smasher: A Silicon Valley Thriller to you for free! 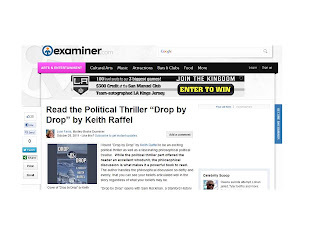 Here's what Andrew Gross, New York Times best-selling author, said about Drop by Drop: "No one puts the crosshairs on Washington, terrorism, and intrigue better than Keith Raffel." Drop by Drop has 19 reviews on Amazon.com, all 5 stars, and not one was written by a relative! Smasher was a national bestseller and has been optioned for film. Publisher's Weekly wrote: "“Raffel blends computer world wheeling and dealing with the academic world's lust for glory and fame in his compelling second mystery...."
Details: Purchase Drop by Drop from amazon.com, barnesandnoble.com, smashwords.com, or the ibookstore in iTunes by 11.59 PM on Sunday, November 27. Then forward your proof-of-purchase to keith@keithraffel.com. Please let me know whether you prefer the Kindle or ePub format and I will email an e-copy of Smasher to you. That's it!